At the end of March, the SoxProspects Staff made their annual trip to Minor League Spring Training. 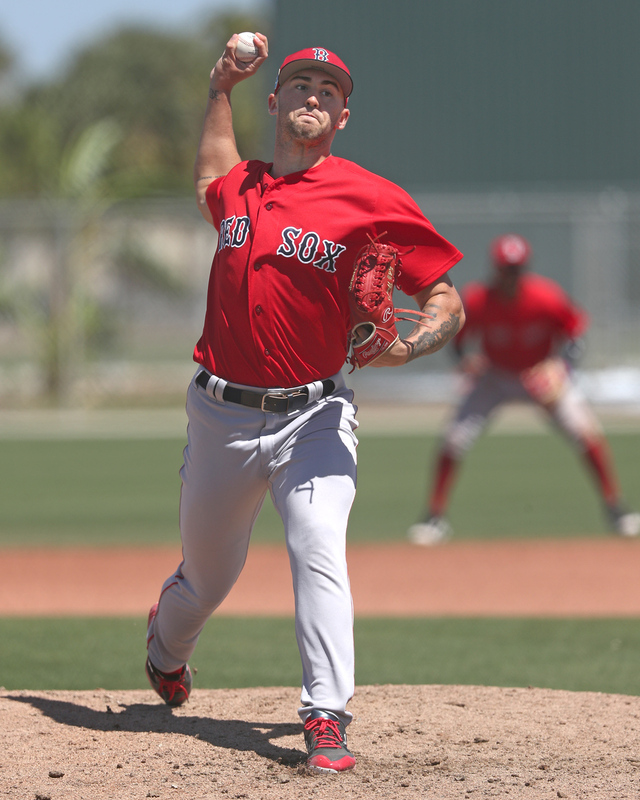 Over the next few weeks their notes and observations will be featured on SoxProspects News. Here is the second edition of Notes from the Field from Spring Training 2018. SARASOTA, Fla. -- Although he was drafted in the fifth round, right-hander Alex Scherff received the third-highest bonus of any Red Sox draftee. Scherff was old for a high school draftee—he will play his first full professional season at 20 years old—but he showed off a big arm in high school, reportedly topping out in the high-90s. Scherff didn’t pitch last season after signing, so Spring Training provided my first opportunity to see him live. Starting for High A Salem, Scherff threw four innings in Sarasota against the Orioles and showed off an intriguing three-pitch mix. However, he also showed that he has a long way to go developmentally. Scherff is listed at 6-foot-3, 205 pounds, with a solidly built frame, especially in his upper body. He doesn’t have much remaining physical projection and is not a standout athlete. Scherff’s delivery is on the rough side and is something the Red Sox might tweak as he develops. Scherff starts on the first base side and throws from a high three-quarters arm slot. He uses a medium leg kick and has a slight trunk twist in his delivery before he comes forward. Scherff’s delivery is very stiff and arm heavy. He has a very strong, live arm, which he uses to make up for not effectively incorporating his lower half into his delivery. He struggled to find a consistent arm slot and release point in this outing, varying it from pitch to pitch. The change in slot was especially noticeable on his breaking ball, when he would come more over the top than when he threw his fastball. Scherff’s fastball sat 90-92 mph, topping out at 93 mph a handful of times. The pitch was on the straight side and he struggled to locate it, especially down in the zone to the arm side. His command was off all outing, and given his delivery, his command profile long-term is a question mark. Scherff featured both his curveball and changeup. Both were very inconsistent, his changeup in particular. He showed slightly better feel for his curve, throwing a few average ones, but for the most part it was below-average. He threw the pitch 72-76 mph, with the majority 74-75 mph. The pitch showed long, 12-to-6 shape it its best, but he wasn’t consistently getting over the pitch and finishing it, and thus struggled to find his release point. As a result, he consistently left the pitch up in the zone and wasn’t snapping it off. Scherff’s changeup, reportedly a potential plus pitch coming out of the draft, also flashed average potential at 79-81 mph. The velocity separation from his fastball was encouraging, but again, he struggled to find his release point with the pitch and rarely threw it in the zone for a strike. Though Scherff struggled for the most part during the outing scouted, he still showed flashes, eliciting several swinging strikes with his fastball and snapping off a few solid breaking balls. Scherff will break camp with Greenville, where he will get his first taste of professional baseball in the hitter-friendly South Atlantic League, which should provide a good test for him.